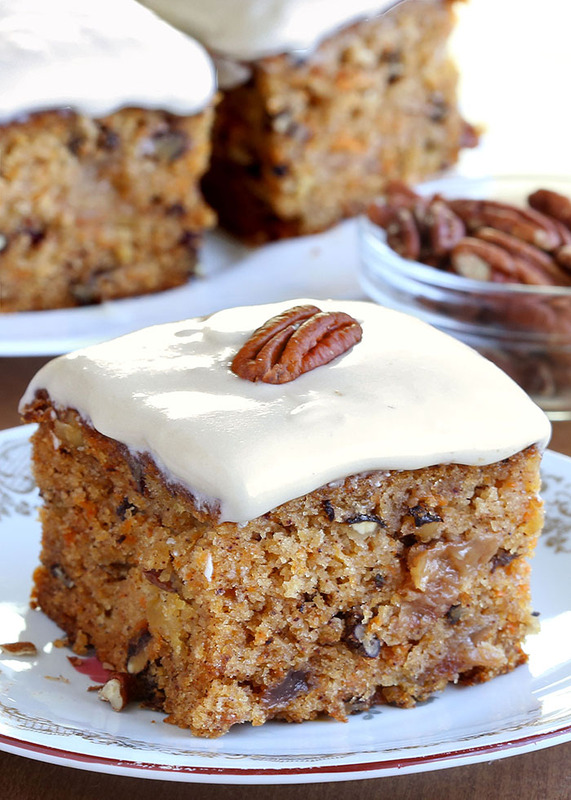 I’m pretty sure that I’d be best buds with Bugs Bunny, because I get a little too excited about carrots and I believe that I would even persuade him to try this cake since this Pineapple Pecan Carrot Cake is everything you’d hope for in a carrot cake. 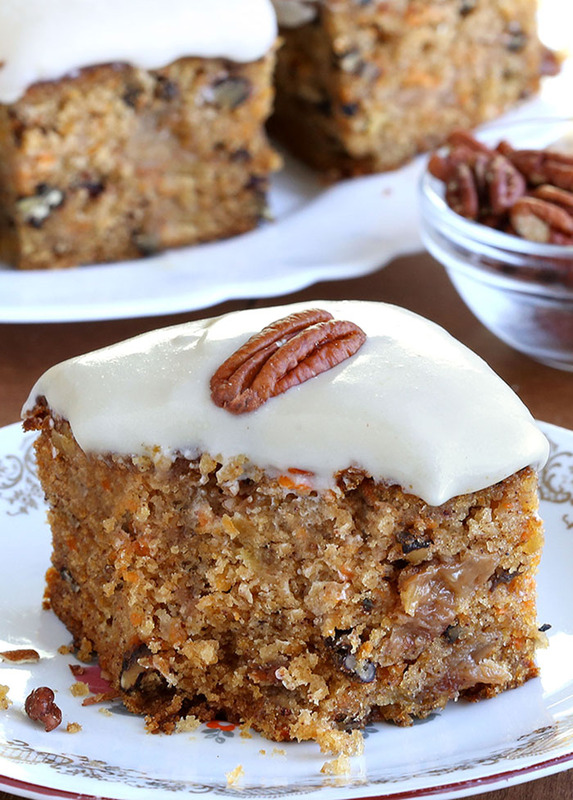 Moist, flavorful and not greasy, which is a risk when it comes to carrot cakes as they typically call for oil. 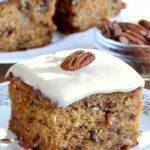 I have to confess, “pure” carrot cake is OK, but I much prefer one with the tangy-sweet bite of pineapple, crunch from pecans and coconut in the cake. For such a dense cake, having a bit of soft crunch in the cake makes a real difference. Though I neglected to add raisins to the cake, I actually think I’d do so next time. I love how raisins morph into soft, moist little pillows of sweetness…. There is plenty of frosting!!! Because it’s everyone’s favorite part, right?? (PS I beat frosting until it’s nice and fluffy which creates even more volume). 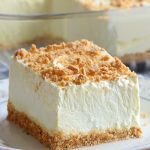 This recipe is made using a 9 x 13 rectangle baking dish but it can also be made as a cake with a filling and frosting on the sides. I’ve made it both ways, but prefer it in rectangle single layer form like this because the cake is moist, it doesn’t need a filling. 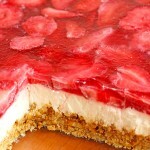 Plus, it is easy to cut into 16 generous pieces – harder to cut a round cake into 16 pieces! 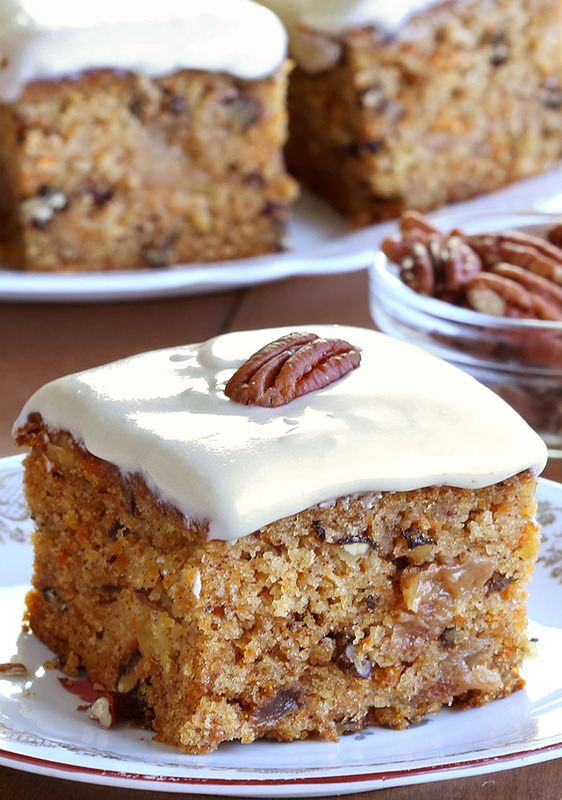 To make Pineapple Pecan Carrot Cake, you’ll start by mixing up your dry ingredients. One important thing when measuring out your dry ingredients is to make sure to spoon and level your flour. I also really love some spice in my carrot cake so I use some ground cinnamon. However, if you love more flavor feel free to mix some ginger, and nutmeg. For the wet ingredients, you’ll be using some oil, eggs, vanilla and white sugar. 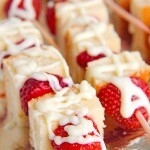 The amount of oil in this recipe adds the perfect amount of moisture, so you end up with a moist cake that isn’t oily. And of course, you’ll also be mixing in some grated carrots. I don’t like to skimp on the carrots when it comes to this recipe, so I use 2 cups of grated carrots. For such a dense cake, having a bit of soft crunch in the cake makes a real difference. However, if you prefer “pure” carrot cake fell free to leave them out because I know that not everyone is a fan of them. In a medium bowl, whisk together the eggs, sugar, oil and vanilla. Mix the flour, baking soda, baking powder, salt and cinnamon in a large bowl. Stir in the egg mixture. Stir gently, just until combined. Stir in carrots, coconut, chopped pecans/walnuts(toast ‘em first) and pineapple. 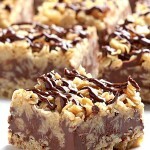 Pour into a 9×13 greased baking dish. Bake at 350F for 40 to 45 minutes till toothpick inserted in center comes out clean. COOL COMPLETELY. Combine all frosting ingredients together (cream cheese, butter, powdered sugar and vanilla) with an electric mixer until smooth. You may need to add a little milk to make it spreadable if your butter wasn’t soft enough. Spread frosting evenly on top of cake. Cut the cake into any size you like.